A pop-up restaurant charging about CA$545 (US$409) per dinner has been chastised due to its proximity to a recently evicted homeless camp. 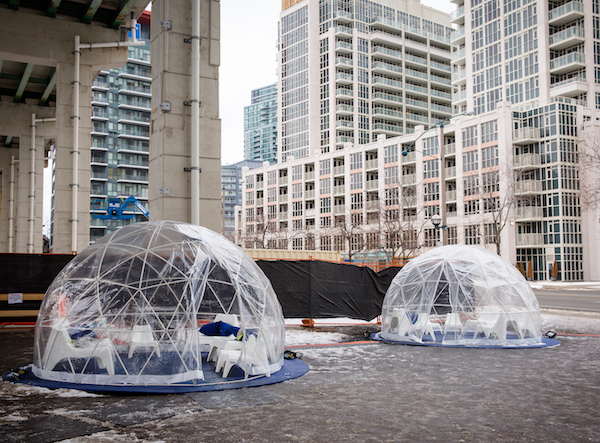 In March, Toronto’s government demolished a homeless encampment under the Gardiner Expressway as a result of a fire that had caught onto a tent. City officials claimed the move was to protect the public against open fires, which were what inhabitants relied on to keep warm. Just two weeks after, a pop-up restaurant named Dinner with a View was set up beneath the same highway. The restaurant, which is made up of exclusive, heated glass domes, is described as a “completely luxurious dining experience in a highly unexpected setting” on its website. Guests are served three-course blind menus created by Top Chef Canada winner Chef René Rodriguez, who also locally sourced ingredients for the meals comprising meat, fish, and plant-based options. People with knowledge of the area’s background have expectedly criticized the restaurant’s organizers for being tone-deaf. While Dinner with a View is still about a mile away from the former homeless encampment, social media users have swarmed the posts of influencers who have dined at the restaurant to voice their aversions. Locals have labeled the pop-up event as “disgusting” and “dystopian,” but the contempt doesn’t just stay online. A free event titled ‘Dinner with a View… of the Rich’ took residence aside the restaurant on Friday as a physical protest by the Ontario Coalition Against Poverty.